Cows’ Personality Traits Affect How They Deal with Stress: Study – FIREPAW, Inc. Cows as it turns out appear to have personality traits similar to humans. 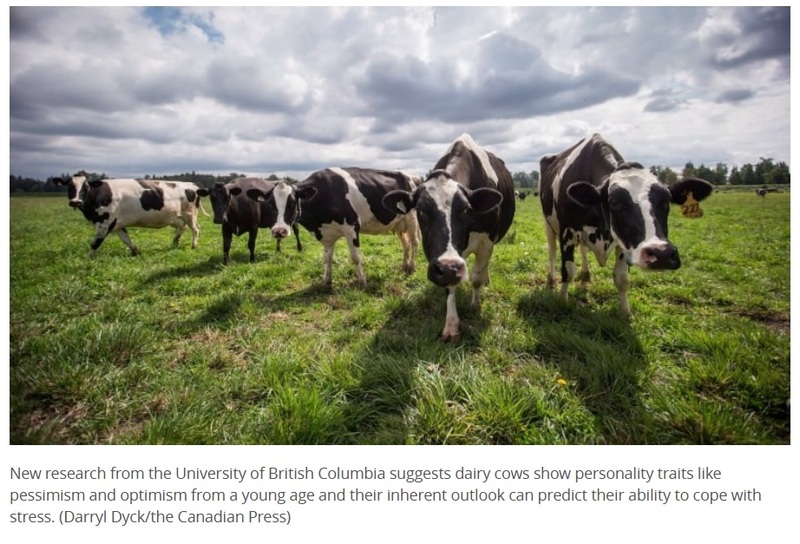 New research indicates that cows’ personality traits include optimism and pessimism and that these traits affect how cows cope with stress. The findings have major implications for factory farming and animal welfare in general. The study which was published last month in Scientific Reports, tested how calves that had previously been identified as fearful, sociable, pessimistic or optimistic reacted under stressful situations like being transported from one barn to another…the more pessimistic calves were more vocal and had higher eye temperatures, which are signs of stress. Now the researchers have followed up that original study by examining those same calves at four months of age, to find out how their personality traits govern their reactions to real-world situations. Transporting the animals was used to test the level of stress experienced and how the animals with various personality traits responded to that stress. Read an interview with the study’s lead author here.